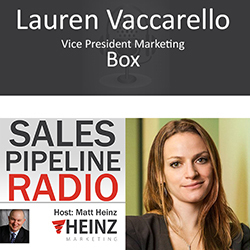 We have guest Lauren Vaccarello who is the vice president of marketing at Box. We are going to be talking a lot about software as a service, sales and marketing and how to do that effectively. This conversation on account-based revenue – targeting the right accounts, partnering with sales, the joys & failures & adjustments associated with execution.